I wanted to take some time to pay tribute to some of the amazing talent we have here in the city of Windsor. I am constantly, and consistently impressed by the amount of truly talented artists, craftsmen, and musicians in our area. In an effort to call attention to some of these individuals, and shine some light on their work we here at Twisted Studio have decided to start a series of articles focusing on local talent specifically. 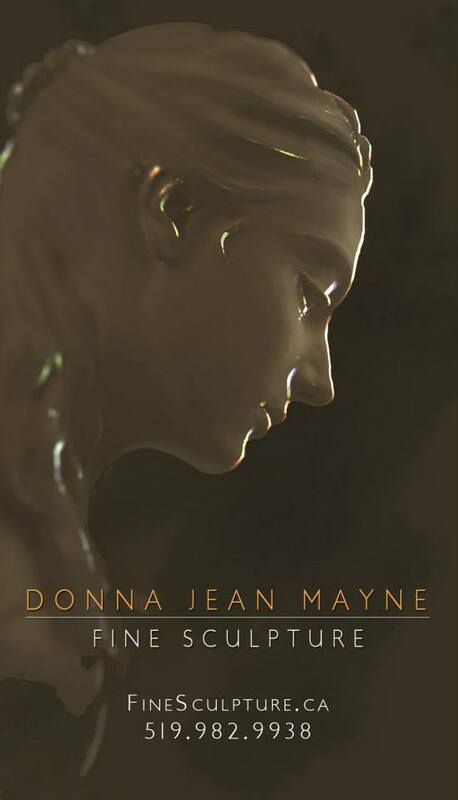 When it came to deciding who this first article would focus on, I had no doubt that it had to be Donna Jean Mayne; the lovely and talented sculptor, painter, and mentor. I had the pleasure of first meeting Donna during my time with her at the Windsor Art Studio when it was located in the old Sandwich Town Firestation. Donna was the coordinator there, along with JoAnne Weston. Both these ladies are tremendously inspiring, and I was immediately humbled by their presence. I felt like they could see right into me, who I am as an artist. They could see through my ego and helped me do the same. I had a questionnaire to answer before being accepted into the program, and in hindsight I’m sure they had a good laugh at some of my answers. All the same, I was accepted…what would follow would be one of the greatest learning experiences of my life. My time at the Art Studio was spent completing small projects, each one Donna had chosen to help me develop some other facet of my artistic skills. The same could be said for the other artists working there. The projects ranged from shading (an area I THOUGHT I already had nailed), to textures, and portraits. Every day that I went home I was excited to talk about what I had learned, and my appreciation for my mentors grew and grew. Donna was a wonderful teacher and guide, I”m sure it was not always easy to deal with multiple artist egos. Never the less, she did it in such a way that we were all well aware of the developmental path down which we were being led. I learned so much during my time with Donna at the Art Studio. Many of the lessons I’ve been able to apply to a number of projects since. Every now and then, I find myself working on a piece and I can almost hear Donna’s voice telling me about mixing my colours (A neutral gray? Really? ), or encouraging me to step out of my comfort zone (like mixing a texture compound into a painting of snow-covered rusty metal). Long story short, even though my time at the Art Studio ended some time ago my respect for Mrs. Mayne continues to grow. Recently, she completed her own website dedicated to the stunning sculptures she has produced. I certainly encourage you to check it out, there are some beautifully tranquil pieces shown, and I”m sure she has plenty more in store. Thank you Donna, for being such a great artistic asset to our area. Your talent is an inspiration to your peers, and anyone else you meet. My jaw is slackened and I am amazed and humbled by this beautiful tribute. What kind words, but in all honesty, I learned and was equally inspired from you and so many other artists that worked with us. However, your keen, unrestrained imagination is something that cannot be learned from another. Thank you so much for this very timely letter. If you don’t mind, I would like to use it in an application I’m currently filling out and post it on my website too. Thank you!!!!! Thanks again Donna! I’m glad you read, and appreciate the sentiment here. I’m truly grateful for the experience I had with you and the other artists at the Art Studio. Please use this in any way you can. Best of luck! Donna Mayne is an amazing mentor and artist. I was also involved in the mural project and my artistic skills were greatly enhanced with Donna’s guidance. She is such a gifted artist and her sculptures are stunningly beautiful. Her friendship is a great gift to me and I’m so happy that she is showing her beautiful creations to all of us. Thank you Paul for this insightful article about her. She deserves every bit of it and more. Donna is truly an inspiration to all. Not only as an artist but as a person. Paul, I am so thrilled that you have so very eloquently put into words how myself, and I’m certain many others, feel about our experience in the art studio under the expert mentoring of Donna Mayne and Joanne Weston. Like yourself, I often hear their words in my head gently steering me towards new paths beyond those I’ve navigated too often. My experiences working in the Art Studio, alongside fellow artists, such as yourself, will remain one of the highlights in my life that I will never forget. Thank you for spotlighting the incredible talent this city has born. Featuring Donna Mayne as your first artist certainly proves that Windsor has some incredible artists! I have been keeping an eye on the wonderful work you have been doing, Paul, and I’m so excited to see how your unique personality has erupted into such fantastic artwork! You seem to have really gained a confidence in your talent, since I met you, that has propelled you to where you are now artistically. KUDOS!